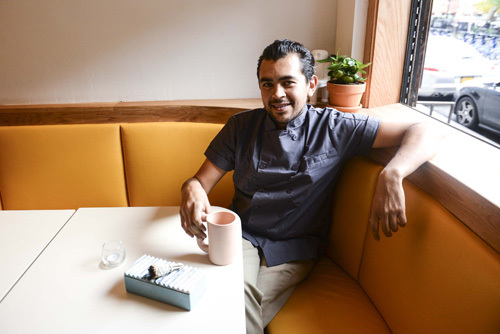 On today’s episode of THE FOOD SEEN, Gerardo Gonzalez, son of Mexican parents from Jalisco, grew up in San Diego, California with the shining sun and bright ideas about what food should look like. In his own personal style, Gonzalez blends California cuisine and his Mexican heritage, to present a creative and vibrant menu at Lalo in Chinatown, NYC. Housed in the once famed Winnie’s karaoke bar, the exterior stays unchanged, but inside you’ll find newly furnished mango-colored banquets and wood light fixtures, enlivening a 1970’s vibe. After gaining much Cal-Mex notoriety at El Rey Coffee Bar & Luncheonette for his designer avocado toast, and vegan chicharrones, Lalo is much more “hippie Chicano” as Gonzalez puts it, heralding complex molé sauces (found in a Brown Goddess Cucumber Salad with brown molé vinaigrette, and a Green Molé Bulgarian Feta dish) and their deep dark almost-burnt flavors, as well as bright, and dark, color palate/palette plates like Stuffed Squid with Chorizo & Hibiscus to “Black Bean” Dip & Chips, which dyes white cannellini beans jet black with squid ink. If you just want a more traditional approach, of course there’s Carnitas, but I implore you to take a journey across this global-minded menu, which even finds influence as close as it’s Ashkenazi neighbors at Russ & Daughters (Toasted Kasha Salad with puffed grains, raw crimini and caramelized onion agrodolce). What Lalo (Gerardo’s nickname) does best, is be himself, as you must see for yourself at Lalo.